Today, Tuesday Nov. 6 is the big election day. Most Americans will be lining up to cast their votes for the presidential candidates of the Political Duopoly. But not me. 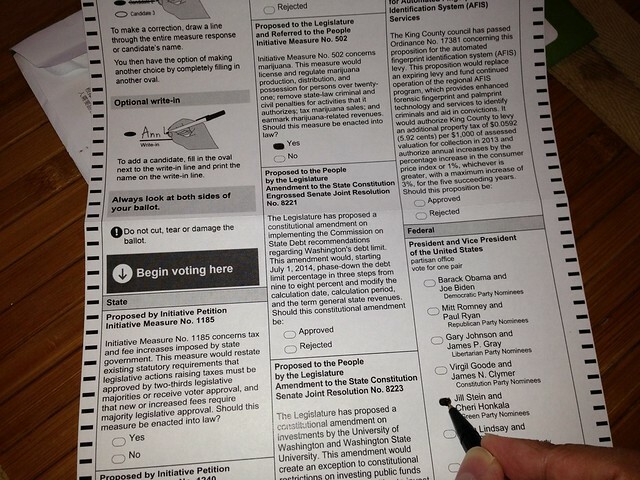 We have a very efficient early vote-by-mail system here in the state of Washington. So I’ve already casted my ballot a week ago. And I voted for Dr. Jill Stein and Cheri Honkala of the Green Party. Those who have been following my political rants on Facebook already know why I’ve decided to go with a Third Party. Bottom line: I refuse to accept the fallacy of the “lesser evil.” So I’ve chosen to exercise my right by voting for the best candidate whom I have the most political affinity. Dr. Jill Stein’s The Green New Deal appeals to my political, environmental, economic, and ethical sensibilities. I understand the “lesser evil” argument. I sympathize with the core reasoning behind it and the idea of long-term political strategy. But I just refuse to be a part of a broken political system which continue to dumb down its citizens and make a mockery of its democratic principles. They happened because people voted for Third Parties. Third Parties have *always* been the engines that have catapulted important change to the forefront of political discourse. Exactly. In addition, there is a 5% rule which makes voting Third Party really matter. So don’t believe people who say voting for Third Party is a “wasted” vote. A wasted vote is a vote in automatic pilot, without knowing the issues, without adhering to your own principles, and without voting with your eyes wide open. I will not bother to list my grievances with Pres. Obama, or why Mitt Romney will be a disaster for the country, or the sobering and chilling similarities between the two on key issues. I’ve already done that before. Thinking about it makes me feel nauseous. I will just recommend to anyone reading this to watch the Third Party Presidential debates and see how different, more substantial, and more focused the Third Party candidates are on the issues that really matter to us–the American people. See also the most recent debate between Third Party candidates Jill Stein and Gary Johnson. And when all things are said and done, who you vote for is up to you. As long as you vote your heart out and go to the polls with your eyes wide open on the issues you care about, that’s still democracy in action, even in the midst of a Two-Party dictatorship whose allegiance is with the Plutocratic Elites. P.S. I’ve already called out the result of the election months back. I believe that Pres. Obama will have his second-term. In fact, I have a running bet with three of my Facebook peeps who are pro-Romney. I can’t wait to collect my winnings when this political kabuki theater is all over. 2) the voice of the Third Party is rising up again and getting more attention. the Democratic Party better get their acts together and live up to their party platform if they want to stay in power and get the majority in both Houses in the next election. 3) as long as we have a Political Duopoly, the Plutocratic elites rule, whether we like it or not. and the long fight of changing the U.S. bi-polar politics continues…. This was posted by c4chaos on Tuesday, November 6th, 2012 at 1:46 am. Bookmark the permalink.